Thirty educators from 15 Oakland schools and institutions have been working all school year to learn about the Agency by Design framework and pursue personal inquiries in maker-centered learning. Here are what a few of them have to say about their experience and the impact of the fellowship has had on their classroom practice and learners. Learn more from the fellows directly at the Culmination Event on May 5th! 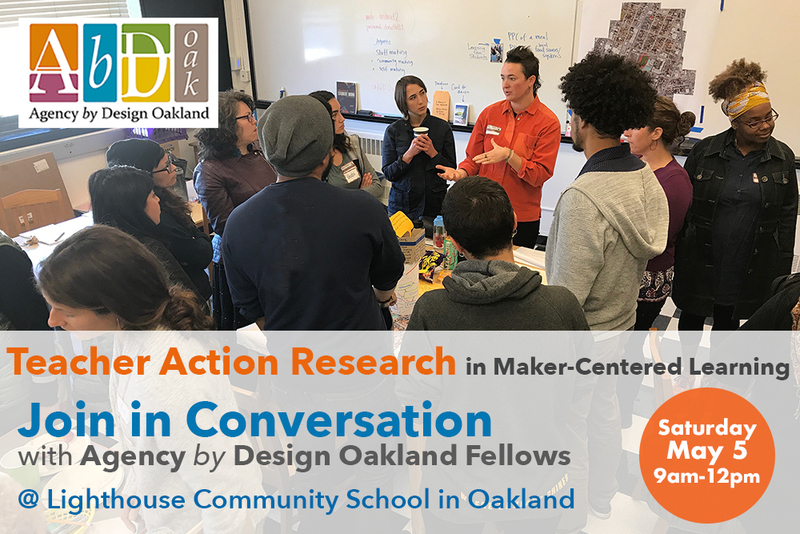 Experience how teacher action research into Maker-Centered Learning is transforming classrooms and schools in Oakland! Leadership & Coaching: How do we ignite and support maker-centered learning at our school sites? Curriculum: How can the Agency by Design framework be integrated into my unit plans? Instructional Strategies: What tools and structures can we create that support strategies like “Re-directing Authority” and “Co-Inspiration”? Thinking Routines and Maker Capacities: How do the Agency by Design thinking routines promote looking closely, exploring complexity, and finding opportunity with my learners? Maker Identity: What does it mean to be a maker? Am I a maker? Do my students see themselves as makers? Systems Thinking: How does current maker/engineering curricula, and professional development, disrupt or perpetuate systems of oppression for students of color? This community of thirty educators represents 15 different Oakland schools and institutions. To learn more about our individual fellows check out the Who We Are section of our website. Free and open to the public. Breakfast will be served. Newer PostTeacher Action Research- Meet the Presenters!